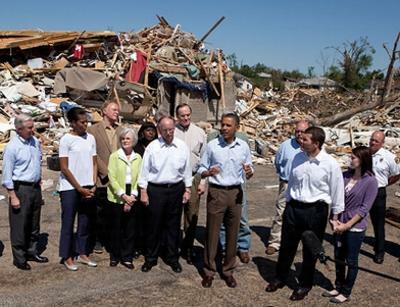 TUSCALOOSA, Alabama, April 29, 2011 (ENS) – President Barack and First Lady Michelle Obama today toured the devastation left by tornadoes that hit Alabama earlier this week and the President approved a Major Disaster Declaration for the stricken state. In Alabama alone, there have been 210 confirmed fatalities; 1,724 injuries and six persons reported missing. A loss of power was reported at the Browns Ferry Nuclear Power Plant. Power is currently being supplied by emergency backup generator. At least 388,000 electricity customers – 16 percent of Alabama – were still without power as of Thursday afternoon. Crews are out clearing roads of fallen trees, power poles and other debris, and more than 300 Alabama State Troopers are assisting with search and rescue. After touring the hard-hit Alberta neighborhood where many houses were completely crumpled or had doors blown off, President Obama and an accompanying group of state and local officials went to the Holt Elementary School outside the city limits. At the school, Alabama Senator Jeff Sessions said that the Alberta area and the neighborhood near the school suffered “the most violent winds and the most damage,” including fatalities. The school was severely damaged and is now being used as a distribution center for aid supplies. The fire, police and emergency management assets of the city have been damaged by the tornadoes, making it even more difficult for communities to cope. As the First Lady hugged survivors, President Obama greeted several residents. “In addition to keeping all the families who’ve been affected in our thoughts and prayers, obviously our biggest priority now is to help this community recover,” said the President. “Fortunately the governor has done an extraordinary job with his team in making sure that the resources of the state are mobilized and have been brought in here,” said Obama, who also praised the efforts of Federal Emergency Management Agency Director Craig Fugate. “We’ve already provided the disaster designations that are required to make sure that the maximum federal help comes here as quickly as possible,” Obama said.